Washington Square Press, 9781476739069, 336pp. On the surface, sixteen-year-old Lesley Holloway is just another bright new student at Hawthorn Hill, a posh all-girls’ prep school north of London. Little do her classmates know that she recently ran away from home, where her father had spent years sexually abusing her. Nor does anyone know that she’s secretly cutting herself as a coping mechanism...until the day she goes too far and ends up in the hospital. Jenn Crowell is the critically acclaimed author of the novels Necessary Madness and Letting the Body Lead. She holds an MFA in creative writing and lives near Portland, Oregon, with her husband and daughter. "Readers will cheer for Lesley's progress in this against-all-odds, sometimes grueling, suspenseful, and character-rich tale of individuation. Bringing to mind Susanna Kaysen's memoir Girl, Interrupted or Jeffrey Eugenides's The Virgin Suicides, Crowell's novel darkly fascinates." "At turns heartbreaking and difficult to read, this is a raw, unflinching look at mental illness and one girl’s one-step-forward, two-steps-back attempts to claw herself out from under. It’s a sobering, yet empowering reminder: in order to create a meaningful life, sometimes it will take all the fight you have." "Etched on Me is one of the first authentic, searing portraits of a young woman's all-out fight for her sanity since I Never Promised You a Rose Garden. There is not one false note in this stark, frightening, and tender story. You will not forget Lesley, or her trials and triumph." "Lesley is set to become your favorite steel-boot-sporting, Kate Bush-loving, self profressed "queer" single mother of all time. Her story will resonate with anyone who understands what it's like to do battle with your mind while simply trying to remember to take a breath and just be here." 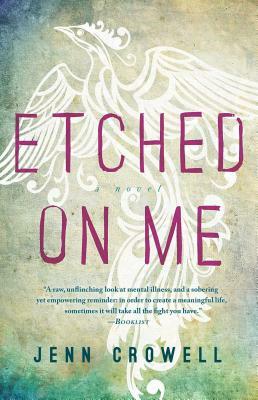 "Etched on Me reinvents the "coming-of-age" novel by making the body of a young woman the center of the drama... As she beats back the abuse from her past and the self-destruction driving her, she discovers there is something alive in her bigger than her rage and hurt. What she has to fight for next will break your heart--just as it should--because what we tell females about themselves is a story that can indeed make or break them. Jenn Crowell will open your eyes with this tale of how the body and heart of a girl can, on her own terms, become that of a woman." “Jenn Crowell fuses compelling social drama, page-turning stay-up-past-midnight storytelling, and unforgettable characters in this honest, smart novel. Lesley’s transformation from being defined by her abusive father, to grasping for and accepting strength from the social services in which she could have drowned will, without an ounce of sugarcoating, melt away your preconceptions and steal your heart." "Etched on Me is what you call a comeback. The mature Jenn Crowell writes with a razor's edge." "Filled with moments of biting humor and sharp insight…I couldn't put it down." "In Lesley Holloway, Crowell has created a protagonist whom I wish I could meet off the page. Confronted with abuse, stigma, and shame, Lesley takes real risks to do more than survive her circumstances: she changes them. Along the way, Lesley draws strength from a small but hardy cast of supporting characters we'd also all benefit from knowing in everyday life. In the hands of an author lacking Crowell’s skill, the novel might risk falling into stereotype and caricature. But Crowell deftly maintains control—unflinching, authentic, and empathic—throughout." "Jenn Crowell has written a miracle of a novel, full of grit and grace; her Lesley Holloway is a character for the ages—wry and whip smart and achingly real. This book will forever be etched upon my heart." "A harrowing and riveting story of a young woman struggling against inner and outer destructive forces to find peace, equanimity and connection. Crowell has written a moving psychological thriller that offers us deep insights into the legacies of trauma and the difficulties of moving forward. It's a wonderful novel."